The newest release at the Whitby Estates in the British Properties of West Vancouver have been released! Only 20 new West Vancouver Aston Hill estate homes are now available for purchase! 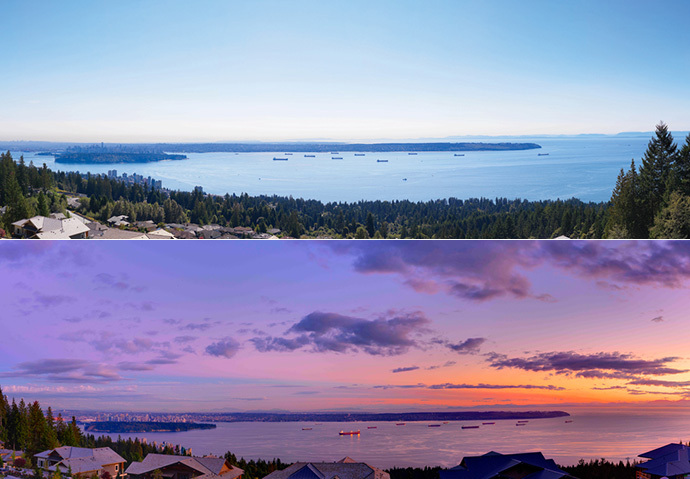 The fine selection of homes have ocean views or mountain views and are situated along Highview Place West Vancouver BC. The duplex style homes offer premium quality features and finishes that are unparalleled in the Lower Mainland real estate market. 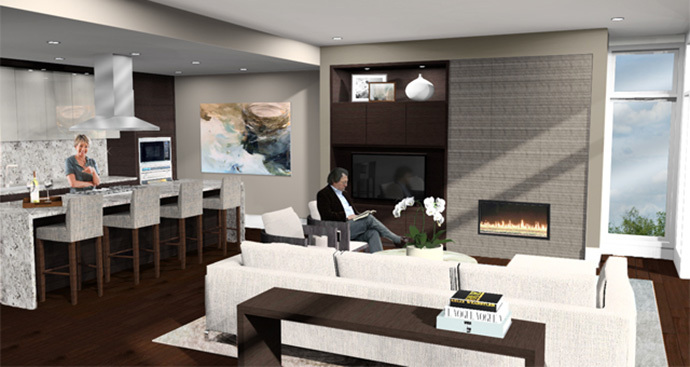 The Aston Hill West Vancouver homes offer exceptional quality in design building, construction and interior design. The eco-friendly homes provide an exclusive living experience for residents. The duplex style buildings at The Estates at Aston Hill West Vancouver feature nine foot floor to ceiling window heights that offer incredible vantage points and natural light in addition to approximate 9 and a half foot ceiling heights. The homes will also be built with reinforced concrete construction structure with the latest in rainscreen technology. As well, there are expansive outdoor living area terraces and landscaping and double car parking garage and private elevator except for the two level plans. The British Properties West Vancouver Aston Hill homes will also feature quality interior hardwood floors in the family room, dining and living areas in addition to natural stone tiled entry foyer. Other interior features include gas fireplaces in the living and family rooms in addition to flat panel horizontal grain Rift White Oak cabinetry in combination with back painted glass upper cabinet doors for a beautiful and modern look. The exceptional kitchens at the West Vancouver Aston Hill British Properties homes will feature SubZero fridge/freezer, Wolf cooktop, hood fan, microwave and wall oven in addition to a Miele dishwasher. For extra privacy, all windows will have sheerweave roller shades. The premium plumbing fixtures are by Toto, Kohler and Blanco. For more information, please visit www.britishproperties.com and register your interest today! > Lot Plan A East (ASTON 4, 5, 8, 9 and 10) – 4,418 square feet, 3 bedroom home over 3 levels with 3,773 sqft total home area excluding the garage. > Lot Plan B East (ASTON 1, 2) – 4,267 square feet, 3 bedroom home over 3 floors with 3,717 sf total home area excluding the garage. > Lot Plan C (ASTON 7) – 2 bedroom, 2 level home at 3,618 square feet total home area including garage (or 3,065 sf minus garage area). 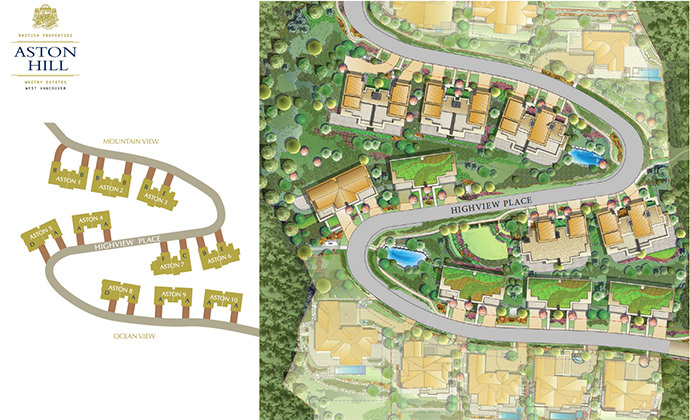 > Lot Plan E (ASTON 3, 6) – 3 bedroom over 3 floors at 4,368 square footage or 3,820 square feet excluding the garage. > Lot Plan F (ASTON 7) – 2 bedroom home over 2 floors at 3,632sf or 3,080 sqft minus the garage area. If you are looking for luxury property on the North Shore of Vancouver, the Aston Hill West Vancouver estate homes is something you must consider! Centrally located in the heart of the prestigious British Properties of West Vancouver, the Aston Hill Whitby Estates homes are close to the Park Royal Shopping Centre, Whole Foods and Osaka Supermarket. As well, you are close to numerous golf courses such as Capilano Golf & Country Club and the Gleaneagles Golf Course Seawall Walk. Other location amenities include St. David’s United Church, Har El Synagogue, St. Christopher’s Church, St. Stephen’s Church and the West Vancouver library. The Aston Hill Whitby Estates are also close to top ranked schools such as Collingwood School, Kay Meek Centre for Performing Arts/West Vancouver Secondary School, Sentinel Secondary School, Collingwood Prep School and Mulgrave School. In addition, you are very close to the Hollyburn Country Club, Ambleside Village, West Van Recreation & Aquatic Centre, Red Lion Bar & Grill, Dundarave Village, Dundarave Pier, Cypress Bowl Ski Area and the West Vancouver Yacht Club. Shopping and dining options are also nearby. 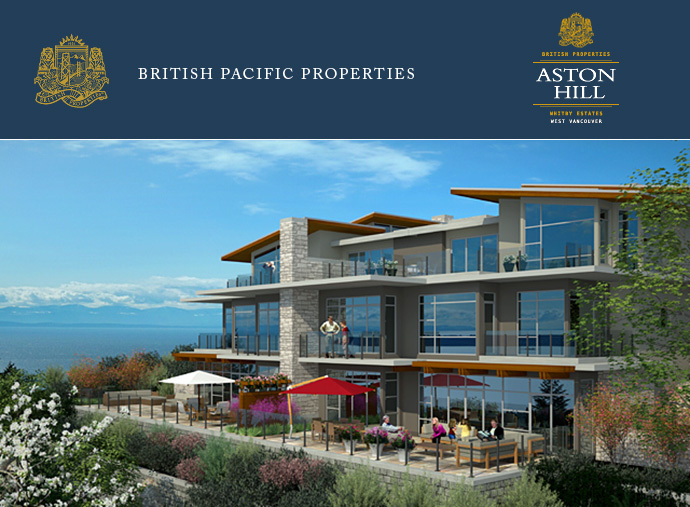 The Presentation Centre for the West Vancouver Aston Hill Whitby Estates is now open in the British Properties. The address is 2701 Highgrove Place West Vancouver and they are open weekends between noon and 4pm or by private appointment. The Estates at Aston Hill West Vancouver sales centre is also located at the Presentation Office and the show homes are available for tours right now. Visit www.britishproperties.com for more details about this beautiful estate home community in West Van.